Residents surveyed the destruction from deadly tornadoes in North Texas as the same storm system brought winter weather to the Midwest on Monday, amplifying flooding that has been blamed for more than a dozen deaths and prompted hundreds of flight cancellations. 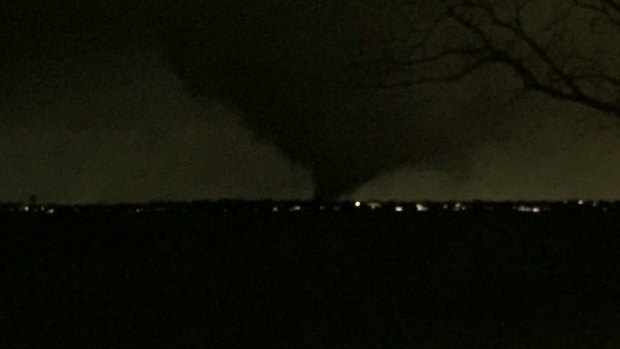 At least 11 people died and dozens were injured in tornadoes that swept through the Dallas area on Saturday, causing substantial damage. Along with flooding in Missouri and Illinois, it's the latest in a succession of severe weather across the country that has led to at least 45 in the last week. A range of precipitation was predicted Monday for the country's midsection, including heavy snow, ice and blustery winds in parts of 11 states, and heavy rain in already-waterlogged parts of Missouri and Arkansas. 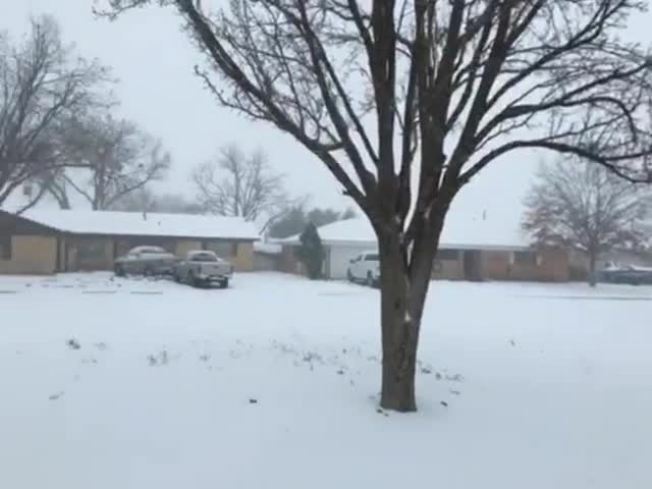 Forecasters with the National Weather Service said a "historic blizzard" could hit the Texas Panhandle, dropping as much as 15 inches of snow around Amarillo and Lubbock. High winds could drive wind chill factor as low as 10 below zero and cause snow drifts several feet high. The storm system caused more than 1,400 flights to be canceled — nearly half of which were at Chicago's two main airports — and 2,600 to be delayed, according to flight-tracking service FlightAware. A typical day sees about 150 cancelations and 4,000 delays. Authorities in Georgia confirmed two more storm-related deaths Monday, including that of a man whose car was swept away by flood waters, according to Gordon County Chief Deputy Robert Paris. Paris said the second body was recovered at Self Lake, and authorities were investigating how that person died. Vito Randazzo of California sat on I-10 for about 13 hours. "Everybody's just sleeping in their cars," said Randazzo, who added that the roadway was snow-packed and icy. "I can't believe the road was left in this condition." Around 9 a.m. Monday he was able to see to drive across a median and get onto a service road. Oklahoma Gov. Mary Fallin declared a state of emergency after blizzard conditions affected the western and central parts of the state and up to a foot of rain fell in the southern and eastern sections. State emergency officials said more than 50 people have been injured and about 175,000 are without power.